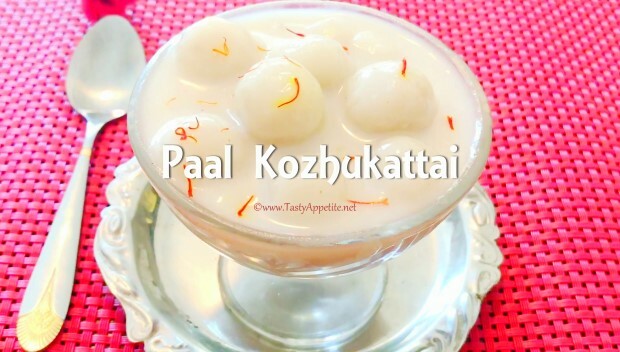 Here comes the very popular chettinad sweet / dessert recipe, Paal kozhukattai. Its a super delicious festival recipe, which can be prepared very easily at home. The rich flavor of coconut milk added in this recipes, gives a divine taste to it. Also this is served as a dessert in South Indian restaurants. In this recipe, the small balls of rice is cooked in milk with sugar, cardamom and garnished with saffron. Check out this authentic paal kozhukattai recipe below. Add to blender and grind to smooth paste by adding enough water. Filter the thick coconut paste by using a strainer and take approximately 3 cups of coconut milk and keep ready. Add 1 cup of boiling hot water in a mixing bowl. Add salt, grated coconut, baking pwd and mix. Add kozhukattai maavu little by little and mix well. Knead the dough to soft and smooth as shown in video. Add coconut milk and thick whole milk to pan. Heat it in low flame. Once the milk starts boiling, turn flame to low and add the rice balls. Stir it once in a while to ensure the balls doesn't stick to bottom. Once the rice balls are cooked, add sugar, cardamom pwd and stir. Cook for few more mins and turn off flame. On cooling the milk thickens further. Transfer the paal kozhukattai to serving bowl. Lipsmacking healthy delicious chettinad style paal kozhukattai is ready.